Since 2010, Family Dog Rescue has rescued thousands of dogs, matching them with loving humans, creating families with every adoption. DOG. From the underdogs of California’s overcrowded municipal shelters to the street dogs of Mexico, Family Dog Rescue gives dogs in need a second chance. We welcome these dogs into our San Francisco shelter and foster program, providing them with medical care, temperament analysis, spay/neuter, vaccinations and finally, a loving family of their own. Family Dog Rescue is proud to save dogs of all kinds, including puppies, adults, mixed breeds, purebreds, and dogs with disabilities. HUMAN. Our experienced, compassionate family of shelter volunteers and staff ensure that our dogs receive proper enrichment and socialization from the time they enter our program to the day they find their new home (and beyond). Our adoption process looks past any formulaic checklist of the perfect dog owner. We treat our potential adopters just as we treat our dogs – on an individual basis. We are proud to connect people to their perfect dog, creating families with every adoption. FAMILY. We believe that when you adopt a dog, a family is created. Through events and social media outreach, we’ve created a community-wide connection between Family Dog supporters, adopters, volunteers and canine alumni. Together, we advocate for greater public awareness about responsible dog ownership and celebrate the connection and love that rescue dogs so openly give. Family Dog Rescue was founded in 2010 by Angela Padilla, a young mom battling breast cancer. As a grassroots-grown, 501c3 dog rescue organization, we save over 800 dogs per year from certain euthanasia and place them with loving families. We sponsor Loup Garou Rescue and the Kern Project, and have been visited or featured by The Discovery Channel, The Huffington Post, PayPal, Martha Stewart Living, Uber, Instagram, Iam Somerhalder Foundation, and Chicken Soup for the Soul. We receive support from Friends of San Francisco Animal Care & Control, PetCo, Maddie’s Fund, and many local Bay Area businesses. Family Dog was named as one of “San Francisco’s Favorite Charities” by 7×7 Magazine in 2014. We’re grateful to have an excellent rating on Yelp and Facebook, as well as a strong community throughout California, the United States, Mexico, Guatemala and beyond. Angela was only 36 years old when she was diagnosed with a very aggressive, high-risk case of breast cancer, shortly after adopting her infant daughter, Bella. 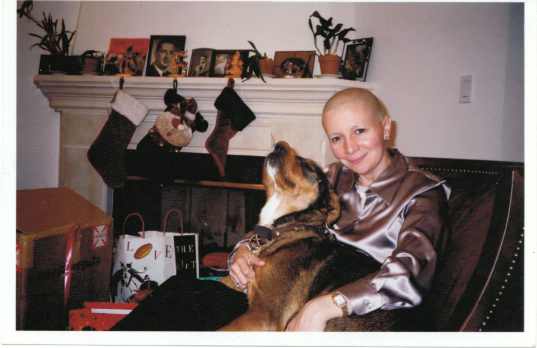 “I will never forget the terror of hearing “You have breast cancer.” Time stood still. My heart plunged into my stomach. I couldn’t breathe. I cried hot, angry, terrified tears. I hugged Bella, my 6-month old daughter, as hard as I could. I didn’t think I would ever be happy again,” says Angela, reflecting on receiving her diagnosis. As a corporate lawyer, however, Angela was never one to back away from a challenge. After a year-long fight, Angela was determined to be in remission. She returned to her job, adopted 2 more children and resolved to make the most of the rest of her life. She recognized the therapeutic role her rescue dogs, Hooch, Molly and Sparkle, played in her survival, and became committed to finding great homes for great dogs. She wanted to open a physical shelter where people could come together to help dogs. A place where she could offer behavioral training and programs for kids and teenagers. And she did. In 2010, Angela founded Family Dog Rescue in San Francisco, California. While the shelter has faced its fair share of challenges, just like our founder, we have never given up on our goal to save homeless dogs, no matter their breed, background, or disability. We never back down from a challenge and, in doing so, have saved thousands of deserving dogs, and have become nationally recognized for our work with deaf, blind, and physical disabled dogs.